This is a great snack pack to have on hand or for anyone heading off to school! The assortment of name brand snacks includes: 1 Nissin Instant Ramen Soup 2.25oz, 1 Kraft Macaroni and Cheese 2.05oz, 2 Microwave Popcorn 2.75oz, 2 packages Pop Tarts (assorted flavors), 1 Combos (assorted flavors) 1.8oz, 5 Quaker Chewy Granola Bars (assorted flavors) .84oz, 2 Nature Valley Granola Bars 1.49oz, 1 Cheez It 1.5oz, 3 Planters Peanuts 1oz, 3 Cheese Crackers 1.52oz, 2 Famous Amos Cookies 2oz, 5 Slim Jims .28oz, 2 packets Quaker instant oatmeal (assorted flavors), 5 Blow Pops, 5 Fire Balls, Bonus-Stay at Home Snacks Mints! Fantastic gift! Perfect for college care packages, military, summer camp, back to school, teachers, coaches, housewarming, road trips, birthdays, get well, and new moms! Stay at Home Snacks does all the work for you! Save a trip to several stores and that costly shipping expense and trip to the post office. This item comes in an exclusive Stay at Home Snacks TM branded box. Items or flavors may be substituted depending on availability. 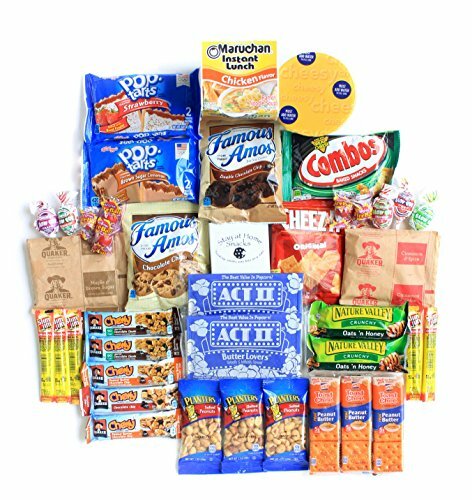 Send some comfort food to your favorite college student or military personnel! Take a care package to your local police or fire station as a thank you! If you have any questions about this product by Stay at Home Snacks, contact us by completing and submitting the form below. If you are looking for a specif part number, please include it with your message.